I spent some time last week talking with a police officer working on the East Coast. I was headed that way to teach at an International Association of Law Enforcement Firearms Instructors regional training conference on extreme close-quarter combatives. The officer contacted me because he was scheduled to attend the conference but could not due to an on-duty injury. He told me the injury was directly related to the conference content and went on to tell me the story. What I was told chilled me, but I wasn't really surprised because I had heard it before. The officer is an experienced law enforcement professional who is a state-certified instructor in firearms, defensive tactics, O.C. spray, expandable baton, verbal judo, etc. He has made hundreds if not thousands of traffic stops over the years and on this occasion made a "routine" (no such thing) traffic stop on a subject who was talking on a cell phone while driving. The stop progressed like many do until the officer attempted to issue a citation. "At this point the suspect became enraged," he told me. "He got out of the car screaming so I backed up and pulled my pepper spray and told him to calm down or I would spray him. He continued to advance toward me aggressively so after several verbal warnings, I sprayed him. The spray had no effect. As a matter of fact, it had more effect on me than him." At this point, the officer did exactly what he was trained to do: He escalated to the next level of force and pulled his expandable baton. "I gave another verbal warning but he still came at me," he said. "I struck him repeatedly in the green zones [approved areas of the body that will cause minimal damage to the attacker], but he just shrugged them off like they never happened. "I have never seen such a raging bull response in a suspect," he continued. "Nothing worked. He was able to pull my baton from my hand, and we started fighting hand to hand. He went for my holstered weapon, and I did what I was trained to do--I grabbed the bottom of my holster and pulled up so he could not pull my gun out. "He was finally able to overpower me and was behind me choking me. He was whispering in my ear 'I am going to kill you with your own gun' the whole time he was choking me." This officer admitted to me that he was "going out" when a group of nearby citizens decided they were not going to let this happen in their town and interceded. The suspect was put behind bars and the officer was rushed to a hospital for treatment. He will be okay and after a period of convalescence will return to work. "I have been through a great deal of force-related training," he told me. "I have practiced a lot, I knew what to do, but everything I knew to be true wasn't. None of the techniques I learned worked. I don't know how to proceed from here." At this point, I told him the harsh reality: Expect nothing. Let me tell you a little secret. We in law enforcement training have known for a long time that force tools do not work on suspects as well as they do cops. Take pepper spray training, for example. We lecture officers on the millions of Scoville heat units in a given brand of OC and how much it will burn when applied. After this buildup, trainers line up the officers and spray them in the face. The normal response is to grab the face and run for water or other substance to remove the OC as snot and spit runs from their face. The others in line watch this and their anticipation builds. Every so often an officer will stand up to the effects and shoot or fight while others will talk about how "tough" he or she is. After this experience, what goes through an officer's mind when they see the spray have no impact on a combative suspect? Think this could cause lag time? Expect nothing. What about batons used on large muscle masses, the green zones? An expandable baton is a hollow metal tube much like a large flashlight. Striking suspects with a flashlight was outlawed in most agencies decades ago because it was well-known that flashlights were poor impact tools unless used against the head or neck. What made us think a smaller, lighter, thinner hollow tube would do better? Consider the chemical cocktail of cortisol and epinephrine that enters the body during "fight or flight." These chemicals prepare the body for injury, making it less susceptible to pain. Since officers are trained to avoid the head, neck and joints when using a baton, is it really surprising that strikes from a hollow tube have little effect on a "raging bull's" taut, activated, flexing muscles in a fight? Expect nothing. The harsh reality is force tools and their accompanying training programs are designed to be socially acceptable and taught in such a way as to reduce liability. Lawyers and police administrators review these programs before they are implemented with an eye toward what will happen if the agency is sued--not toward whether or not an officer can effectively repel a murderous attack. I know; I have been on these committees. The U.S. Supreme Court ruled in Graham v. Connor and Garner v. Tennessee that force must be "reasonable" based on the circumstances at hand. The truth is law enforcement training programs are often designed to deliver a minimal level of force, not a reasonable one. In 1976 I sat down with a veteran of the trench warfare of World War I, some of the most extreme close-quarter fighting in history where men were killed with shovels, trenching tools, clubs, knives and pistols as one trench or tunnel unexpectedly intersected with another. It was truly kill or be killed, and this man revealed his secret for winning in such extreme fighting: "Affect their ability to see and/or breathe, and you shall win the day." What if the officer I spoke to at the beginning of this article had poked his attacker in the eyes or punched him in the Adam's apple instead of pulling up on the bottom of his holster? Would that have ended the raging bull assault? Nothing is certain, but I am willing to bet since he could not see or breathe that it would have had a serious impact on his physical abilities. Would such a technique be reasonable? The suspect was trying to kill him via his own gun, so deadly force would be reasonable, but poking him in the eyes or punching his throat would not be minimal and would certainly cause liability concerns. 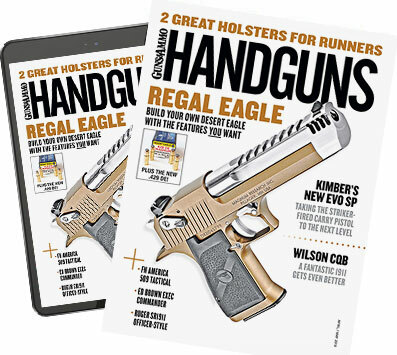 We have known for over a century that handgun rounds are not effective man-stoppers regardless of caliber, but writers and trainers continue to expound the virtues of one caliber or another. I recently had a very well-known instructor try to convince me the .45 will stop a determined attacker nine out of 10 times with a solid torso hit--even though I have a file full of cases that directly contradict this assertion. Forget your preconceived bias about handgun calibers and take 9mm, .40 S&W and .45 ACP cartridges and hold them against your chest. See how small they all are? Is it wise to expect such small projectiles will stop a raging bull suspect with one or two rounds to the torso? Hell, there are many documented cases where handgun rounds have not penetrated the skull when fired at close range. Expect nothing. Medical professionals have told me for years the human organism is quite easy to kill but very hard to stop quickly. There is no nice or gentle way to apply a level of force that will stop a raging bull quickly. Fighting is like chess; you must be thinking one or two moves ahead in order to win. In a fight for your life, expect nothing to work and be prepared to do something else if you wish to prevail. Like bullets, we have known for centuries that the person who will win in conflict is not the one with the most gadgets or training: It is the more ruthless who will go to extremes to prevail. Unfortunately, such ruthlessness is seldom seen as reasonable in the eyes of the protected public. Good luck.